A recent study found that people who consumed oatmeal—either instant or old-fashioned—felt fuller and had a suppressed appetite over four hours, compared to people who ate ready-to-eat boxed cereals. While we’re sure you’ve tried the hearty whole grain for breakfast, we have good news for you: It tastes equally as delicious as a savory snack or meal, any time of the day. Check out 16 ways to enjoy the filling food, any time of day. 1. Bring water to a boil in a pot. Pour in oatmeal, reduce heat to a simmer, and cover. 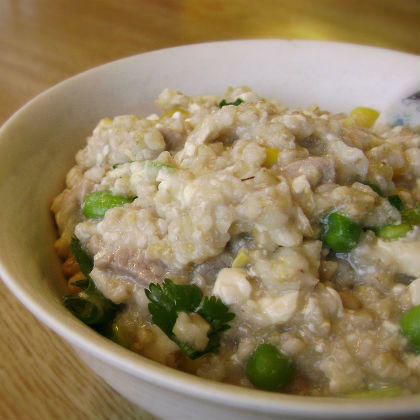 Cook for 25 to 30 minutes, until oats have reached desired tenderness. 2. Meanwhile pour oil into a saucepan over medium heat and bring to a simmer. Add onion and garlic and saute for 3 to 5 minutes. Add mushrooms and thyme sprigs and saute until mushrooms turn golden brown, about 5 to 7 minutes. (If liquid dries too soon, add 1 teaspoon oil at a time.) Remove thyme sprigs. 3. When oatmeal finishes cooking, remove from heat and fold in gouda. Scoop into pan with vegetables and mix thoroughly. Transfer to serving bowls and add olive oil, salt, and pepper to taste. Garnish with fresh thyme leaves. Mix oats, water, and a pinch of salt in a microwavable bowl and microwave on high for 3 minutes. 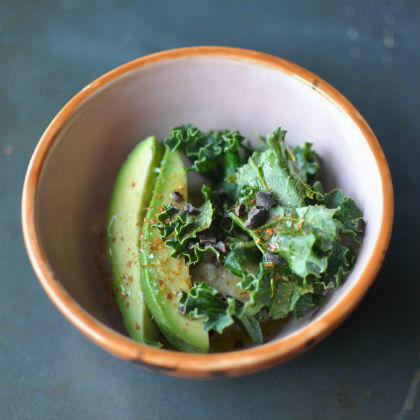 Top with kale and avocado, sprinkling avocado with salt to taste. Top oatmeal with chili flakes, drizzled olive oil, and cocao nibs. “Wakame adds umami to the oatmeal, and there’s a nutty, crunchy textural contrast from the soy nuts,” says Escapades in Cookery’s William Chen. His recipe makes one large serving, so be sure you’re hungry. Bring water to boil in a small saucepan. Add oats and lower to medium heat. Simmer for 3 minutes, until water has reduced and oats are starting to thicken. Turn heat to medium-low and add soymilk and wakame, stirring for another minute. Add soy sauce and stir another minute or until seaweed has softened. Pour oatmeal into a bowl and garnish with soy nuts. 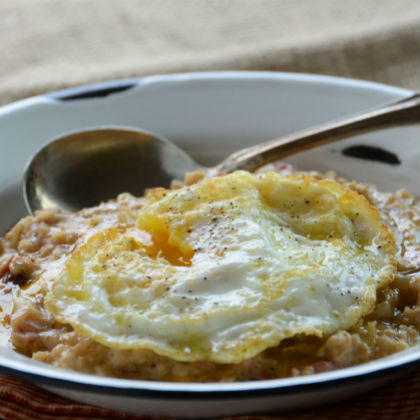 “The inspiration for this oatmeal recipe came from a Thai rice porridge breakfast I had in Bangkok,” says (Don’t Be) Too Timid and Squeamish blogger Marcy Light. 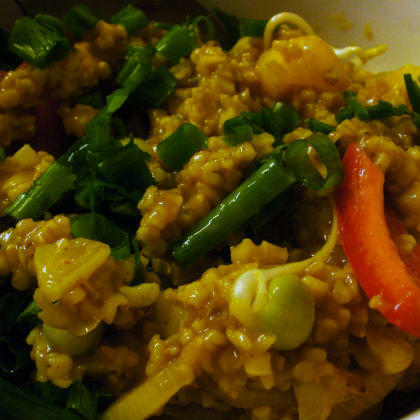 “As with many savory, spicy, crunchy Thai recipes, you can adjust the condiments to suit your own tastes. Combine oatmeal and stock in a saucepan and cook over medium heat for 5 minutes, stirring occasionally. 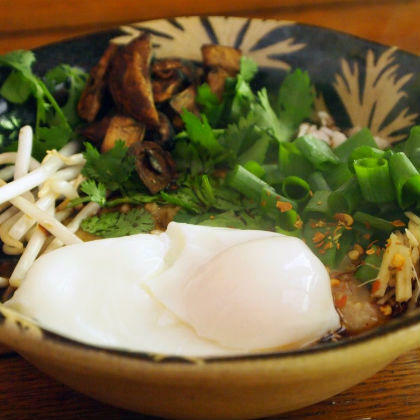 Pour into a serving bowl and top with egg, mushrooms, and remaining ingredients as desired. 1. Combine oats and water and cook on high heat in microwave for 2 and half minutes or until cooked. Set aside. 2. Heat canola oil in a skillet over medium-high heat and add mustard seeds. When they start to pop (about 1 to 2 minutes), add peanuts, onion, serrano, ginger, chili powder, and curry leaves. Stir and cook about 3 minutes, until peanuts are lightly toasted and spices are aromatic. Add tomato and salt to taste. Pour in oatmeal and cook another 1 to 2 minutes, until heated. Stir in cilantro and serve. 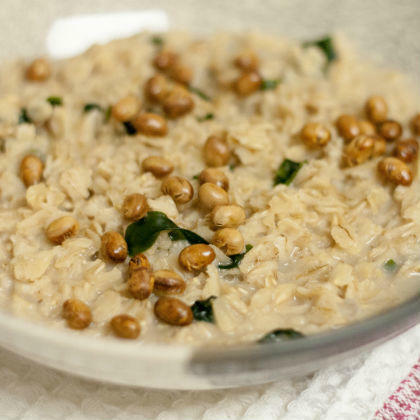 “With its classic Italian flavors, this oat dish reminds me of spaghetti bolognese. It has no meat, cheese, or pasta, but it’s just as hearty,” says Lilly Hippel, the human half of A Girl and Her Food Processor. Boil water and stir in oats, reducing heat to medium. Cook for about 5 minutes, then taste-test oats; they should be about halfway done. 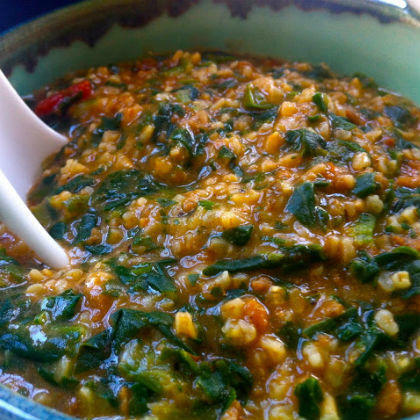 Stir in spinach and nutritional yeast, and continue to simmer on medium heat about 5 minutes or until spinach is thawed and oats are at preferred chewiness. Stir in marinara, protein crumbles, salt, and pepper and cook another 1 to 2 minutes to evenly heat all ingredients. 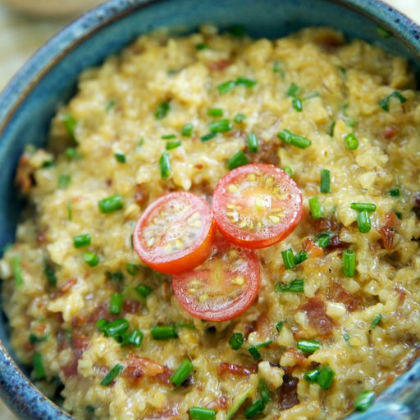 “The nutty, wholesome oats, plus the trio of smoky bacon, fresh ripe tomato, and sharp cheddar, makes for a surprisingly perfect combination,” promises Anne, who blogs with her mother, Donna, on Apron Strings. 1. In a large skillet over medium-high heat, cook bacon in batches, turning frequently, until browned and crisp, about 5 to 8 minutes. Set aside on a paper towel. 2. While bacon is cooking, bring milk, water, and stock just to a boil in a medium saucepan over high heat. Stir in oats and reduce heat to a simmer. 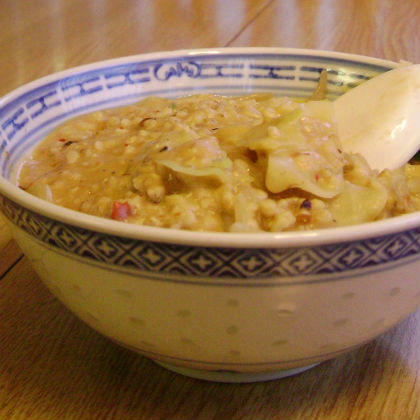 Cook, stirring regularly, for 25 to 30 minutes, until liquid is absorbed and oats are tender and cooked through. Stir in cheddar, chives, salt, and pepper and taste for seasoning. Just before serving, crumble bacon and stir into oatmeal. Top with cherry tomatoes and extra chives and serve cayenne pepper sauce on the side. 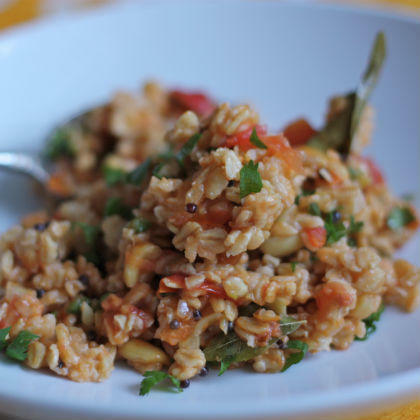 “A twist on an old favorite, this spicy one-pot oatmeal curry can be tweaked depending on whatever veggies you have in the fridge,” says Judy Trinh, of her namesake blog Judy’s Home. Her recipe makes one “gigantic” serving, she adds, so consider sharing. Bring oats and water to a boil, then reduce heat to medium-high and simmer for about 30 minutes, stirring occasionally, until liquid has evaporated. Toss in curry powder, salt, and fish sauce and mix. Add veggies and chicken and remove from heat. Garnish with green onions. 1. Heat oil in a small saucepan over medium heat. Add bacon and cook until crisp, about 2 to 3 minutes, stirring occasionally. Transfer bacon to a small bowl and set aside. 2. Add onion to oil and cook, stirring occasionally, until softened and just starting to turn brown, about 3 minutes. Stir in oats, water, salt, and pepper. Bring to a boil, then turn heat to low and simmer until oats are tender, about 5 minutes. Turn off heat and stir in bacon and cheese. Transfer to a bowl and top with fried egg and more black pepper, if desired. “The rich, tangy flavors of kalamata olives, sun-dried tomatoes, and feta cheese will bring the sunny Mediterranean to your humble bowl of oatmeal,” Marcy Light says. 1. Combine oatmeal, stock, oregano, and pepper in a saucepan and cook over medium heat for 5 minutes, stirring occasionally. 2. Heat 1/2 tablespoon oil in a pan over low heat. Add garlic, olives, and sun-dried tomatoes and saute about 3 minutes, until tender. 3. 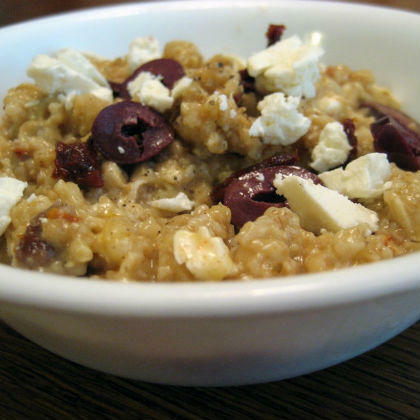 Top oatmeal with vegetable mixture, add feta, and drizzle with remaining oil. “By adding in unusual ingredients like cilantro, soy sauce, and tofu, oatmeal can be transformed into a bowl of comforting gooey, creamy mess packed with tons of Asian flavors and many good-for-you nutrients,” says Stephanie Chung, who posts at A Nutritious Plate. Add first six ingredients to a small pan over high heat, stirring well and breaking tofu into chunks. Bring to a boil, then turn down the heat to simmer until tofu is heated thoroughly, about 5 minutes. (Add water if mixture gets too thick.) Slowly pour in egg while slowly stirring and bring mixture to a boil again. Remove from heat and stir in scallions. Serve with splash of soy sauce, if desired. “This recipe brings together a lot of my favorite foods, flavors, and textures. 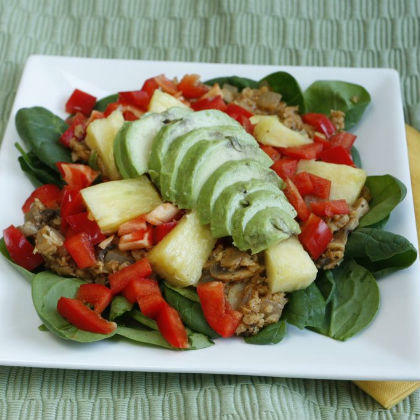 I love the combination of sweet and savory, as well as the soft texture of the oats and avocado with the crunchy pepper and juicy pineapple,” says Heather Nauta, who shares her recipes on Healthy Vegan Recipes. 1. Heat a pot over medium-high heat and cook onions and garlic in wine for 5 minutes. Add mushrooms, lime zest and juice, herbs, paprika, and salt and cook for another 10 minutes, until mushrooms are softened. Add oats, water, and nutritional yeast and stir to combine. Turn heat down to medium-low and let cook for 5 minutes, or until oats are softened and liquid is absorbed. 2. You can either serve this over a bed of fresh spinach and topped with pepper, pineapple, and avocado, or stir spinach, pepper, and pineapple in to cook a little bit and then serve topped with avocado. “A bowl of oatmeal built from the flavors of my favorite noodle dish, dan dan noodles, this is creamy, spicy, peanutty, and overall very flavorful,” Stephanie Chung says. 1. Bring water to a boil in a pot over high heat. Add bean sprouts and cabbage and simmer on medium heat until tender, about 5 minutes. Drain and set aside. 2. In the same pot over medium heat, add stock, oatmeal, sprouts, and cabbage. Cook for 3 minutes, stirring occasionally. 3. Meanwhile in a small bowl, mix together chili sauce, peanut butter, and sesame paste. If mixture is too thick to stir well, add a splash of hot water to help paste blend together. Set aside. 4. When oatmeal is heated thoroughly, add sauce and scallions. Stir well and remove from heat. Cover pot and let sit for 2 to 3 minutes. Serve drizzled with sesame oil. 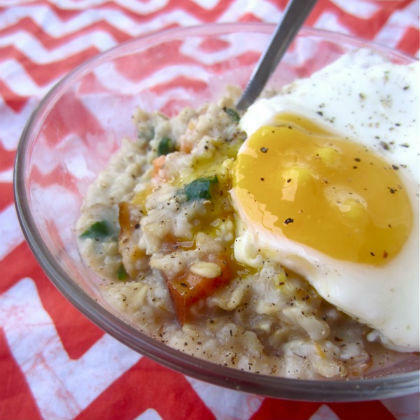 “These Italian-style savory oats are full of rich flavors like garlic, basil, and tomato. The texture is similar to that of risotto, but the meal comes together much quicker than risotto would,” says Fear of Bananas’s Stephanie Smith. In a saucepan over medium-high heat, add oil, sausage, garlic, and basil and saute for 3 to 5 minutes, until browned. Remove sausage from pan and set aside. Deglaze pan by pouring in wine, scraping up any brown bits from the bottom of the pan with a wooden spoon. Add water and bring to a boil over high heat. Add oats, reduce heat to medium, and cook 3 to 5 minutes, until most liquid is absorbed. Mix in tomato sauce and pesto, then add sausage and cheese, mixing well until cheese is melted. Serve topped with pickled vegetables, if desired. 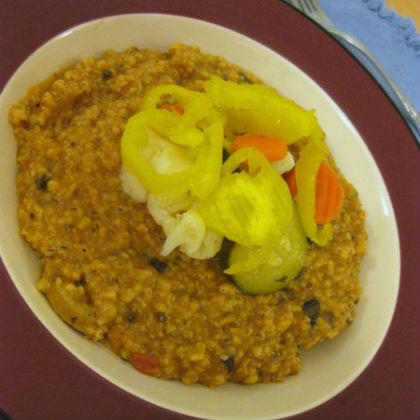 “The vegetables and spices transform creamy oatmeal into spicy, nutty dish that reminds me of southern-style grits without the grittiness,” says Alex, the blogger behind Spoonful of Sugar Free. Boil water with oats in a small saucepan over high heat, stirring occasionally, until thick and creamy, about 15 to 20 minutes. Stir in spinach, then remove from heat. Add squash, spices, and salt and pepper to taste. Top with fried egg, if desired, and serve warm. 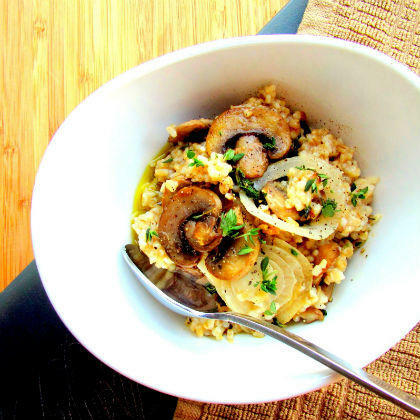 “This delicious oat dish is super creamy and wonderfully comforting—and guilt-free!” says Tiffany, of The Gracious Pantry. Add oil to a non-stick pan over high heat. Once hot, add onions and mushrooms and saute for 3 to 5 minutes, until translucent. Stir in oatmeal and blend well. Once oats are hot enough (about 1 to 2 minutes if oatmeal has been sitting at room temperature or 4 to 6 minutes if it’s cold), stir in Parmesan, turn heat off, and allow cheese to melt as you continue stirring. Add salt and pepper to taste. 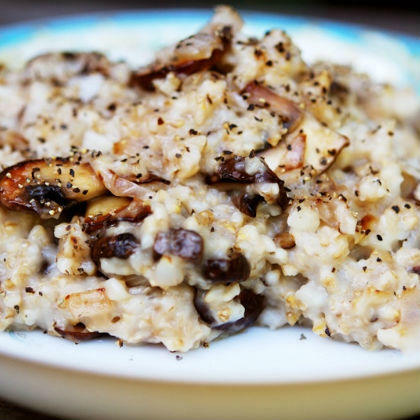 Be the first to comment on "16 Savory Oatmeal Recipes"